Anyone seen these around town? What a cool idea. And they're environmentally friendly too! Do you downtown Raleigh-ites think it will be a successful enterprise? I'm thinking they could be a hit among bar-hopping crowds. Girls in fancy shoes hate to walk more than a block or two. I don't recall seeing them around Raleigh (don't go downtown much these days) but they're fairly common in Carrboro and Chapel Hill. A great way to get from a bar on Franklin to say, Cats Cradle. I saw them Downtown when I was at the World Beer Festival last Saturday. It's a proven successful enterprise that has been a hit in places like Coconut Grove in Miami, FL (except that there they are just pure leg-powered rather than bicycles). If they hang around the right spots, they'll do just fine. And yes, girls quite often end up in very uncomfortable but great-looking shoes when they go out (yes, I am one of them). The less we have to walk to get where we're going, the more dancing we can do when we get there. They've been around F street for the past couple weekends since its been getting warmer, but i have not seen them at all around glenwood or the warehouse district. havnt used one cause i think walking around is part of the fun at night. I used these all the time when I was in Austin, TX last year. I think its a great idea and I've been wanting Raleigh to get them for quite some time. I saw a few outside of Memorial Auditorium last weekend as a matter of fact - and I know a lot of my girl friends would definitely rather take a rickshaw rather than walk around in those high heels, haha. I have yet to see them, but I haven't been out and about downtown at night. I have seen the carrige rides during the day though. Is it me, or do they seem to be a sandwich board that just happens to move people? If I was still single, I'd sign up to be a cyclist for them! Do they have any affiliation with the Downtown Raleigh Alliance, or is it just someone who wants to start the business? I don't want this to be a trolley substitute, but a suppliment to other circulator services eventually provided by CAT. It is good to see that they're not just sticking to certain areas... I don't think many people go to Raleigh Memorial Auditorium and The Dirty in the same night, but the cart drivers understand that both markets are a part of downtown. I've seen something similar on the Atlantic City boardwalk. Since it is one long stretch vs. a grid of streets, and the "good stuff" (casinos) are spread apart with filler discount stores and snack shops, walking can take a while. Glenwood and F Street are longish, somewhat intimidating streets that this service could offset. If NBC 17 was in downtown Raleigh (or Durham), they could get around town in a modified version of this. Instead, they send a van in from Highwoods. When, if ever, will they get out of their suburban mindset? 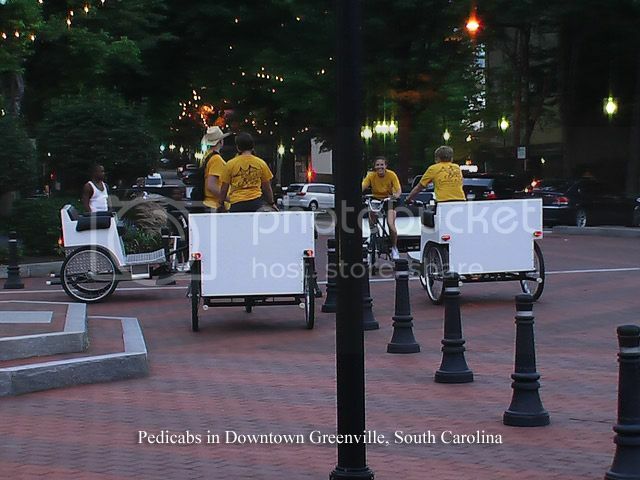 This pedicab service is also expanding into Durham. Saw 5 of them last night gathered outside Yancy's last night around 10pm or so. Also saw them last weekend cruising full of ladies headed north on F Street. I'm more about the walking but still think it's a cool idea. We got these things last year in Greenville. They are an excellent addition to the urban lifestyle we love to enjoy, and they do save fuel as well as help to prevent additional strain on the environment. WRAL story... seems that business is strong and growing for Raleigh Rickshaw. I've seen them a few times, but only once actually carrying anyone... the guy was struggling up the huge hill on Glenwood up to Peace.